Craggantoul is an area of agricultural land immediately adjacent to Ben Lawers National Nature Reserve and was acquired by the Trust in 1991 as part of a long-term objective to gain control of heritable grazing rights on designated hill ground. It includes a narrow strip of non-native conifers planted as a shelter belt, presenting an unsightly blot of a landscape known for its scenic qualities. The area is starting to suffer from wind blow and requires clear-felling, which is not without complication because the timber must be extracted. Replanting, a condition of the felling license, would use native species. $15,600. The National Trust for Scotland cares for over 270 miles of upland paths, providing access to 187,800 acres of glorious Scottish landscape. Footpaths must withstand Scotland’s temperamental climate, including rain, frost, snow, gales, floods, and even occasionally blazing sunshine. 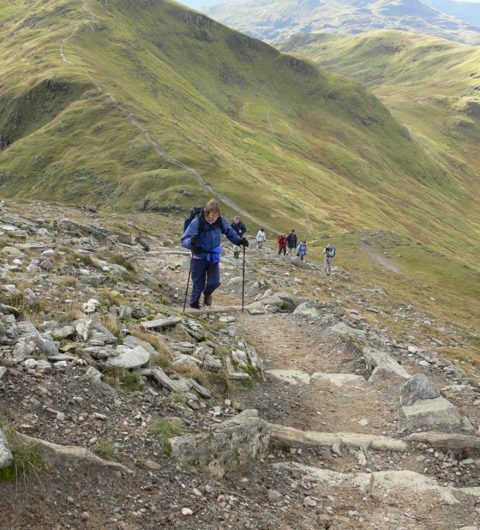 Without dedicated management, footpaths will erode and scar the landscape, leading to irreversible damage on Scotland’s magnificent mountains. Using locally-sourced materials, the Trust works by hand or helicopter to make minimal visual impact but to ensure the safety of visitors and protect the land from erosion. Donations to the Footpath Fund help to repair, improve, and conserve footpaths that reach into some of the most beautiful, wild places in Scotland, including Glencoe, Ben Lomond, Torridon, the Grey Mare’s Tail waterfall, and Goatfell on the Isle of Arran.